This article is about the city in Iraq. For other uses, see Al-Zubayr (disambiguation) and Zubayr (disambiguation). 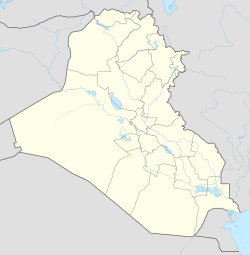 Az Zubayr (Arabic: الزبير‎) is a city in and the capital of Al-Zubair District, part of the Basra Governorate of Iraq. The city is just south of Basra. The name can also refer to the old Emirate of Zubair. The name is also sometimes written Al Zubayr, Al Zubair, Az Zubair, Zubair, Zoubair, El Zubair, or Zobier. The city was named al-Zubair because one of the Sahaba (companions) of the Prophet Muhammad, Zubayr ibn al-Awwam, was buried there. During the Ottoman times, the city was a self-ruling emirate ruled by an Emir (or Sheikh) from Najdi families, such as Al Zuhair, Al Meshary, and Al Ibrahim families. Like other Emirates under the Ottoman Empire, the Emirate of Zubair used to pay dues and receive protection from the Ottomans. In the 19th century, the city of Zubair witnessed relatively large migrations from Najd. Up until the 1970s and 1980s, the town was predominantly populated by people of Najdi origin. Now only a few families remain of the old inhabitants. Most of them moved back to their homeland of Najd and other regions of Saudi Arabia and to Kuwait. In the period when Najdis inhabited the city it was dominated by the Sunni denomination of Islam, in stark contrast to the Shia-dominated Basra nearby. By 2008, the city of Zubair had a population of around 240,000 people and had grown to merge into the Basra metropolitan area with nearly 3 million inhabitants in total. As in Basra, the municipality of Zubair currently has a Shia majority and is barely distinguishable from Basra itself. But, contrary to Basra, Zubair is still home to a large Sunni minority. However, they have faced violence from Shia militants, and many have fled to Gulf countries and Sunni areas of Iraq. Az Zubayr has a hot desert climate (Köppen climate classification BWh). In winter there is more rainfall than in summer. The average annual temperature in Az Zubayr is 24.5 °C (76.1 °F). About 139 mm (5.47 in) of precipitation falls annually.